Extraordinary collection of unseen photographs of the Beat Generation. The first book ever published with colour shots of the Beats. This magnificent book features a remarkable collection of largely unseen photographs of the Beat Generation by renowned Magnum photographer Burt Glinn. This amazing, untouched treasure trove of images was discovered when R|A|P was working with Burt Glinn’s widow, Elena, on a larger retrospective of Glinn’s work. The book features black and white shots, and also over 70 images in colour: an extremely rare find, these photographs manage to capture the raw energy of the Beat Generation in a way that has never been seen before in print. The photographs were shot between 1957 and 1960 in New York and San Francisco and feature nearly everyone involved in the scene, including Allen Ginsberg and Jack Kerouac, poets like Gregory Corso and William Morris, and many more. Archived with the negatives was a short essay by Jack Kerouac entitled “And This Is The Beat Nightlife of New York”, which is published here alongside the photographs. 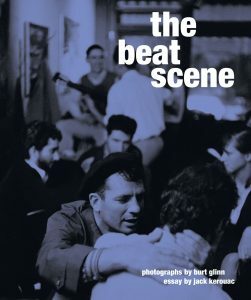 Glinn was celebrated for his extraordinary talent as a social documentary photographer and during his time with the Beats, his camera captured the spirit of the counterculture – writers, musicians and artists meeting in cafes, bars and parties to pursue a truth and future the mainstream would and could not acknowledge. This exquisite tome is an intimate and fresh insight into the lives of the legendary and in uential Bohemians and a celebration of Glinn’s inimitable talent.